Backing up or restoring the data of a SharePoint farm is one of the major concerns for many SharePoint administrators. Among the numerous factors to keep track of is the necessity to maintain the quality of data throughout the farm. However, by adhering to a few best practices, administrators can greatly reduce the risk of data loss or corruption in SharePoint 2013 farm backups. Testing the backups and validating their consistency at regular intervals can help administrators avoid disasters in the time of crisis. Running practice recovery operations can help validate contents of backups and ensure that the entire environment can be restored from them. In case administrators need to test backup/restore operations for SharePoint servers located in different geographical locations, they can simulate those tasks by setting up remote farms. 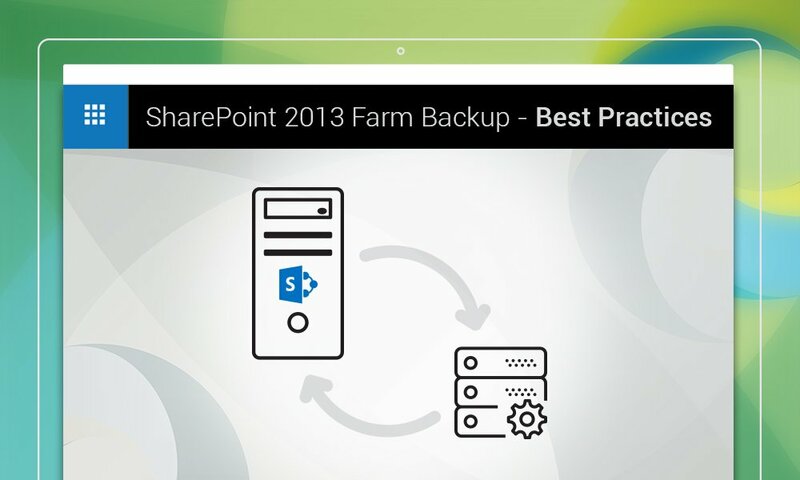 Once that is done, they can restore the SharePoint farms by using the database-attach method. In this method, administrators upload a copy of the database to the remote farm and redirect users. Trial restorations performed at regular intervals can also expose potential hardware issues that can hinder restoration of data. SharePoint 2013 does not make backups of trace logs generated by the Unified Logging Service (ULS). However, the data stored in these logs can come in pretty handy when admins need to analyze performance, troubleshoot, or check for compliance with SLA-s. As such, they should make backups of this data, as part of routine maintenance. SharePoint log files are stored in the following path by default – C:\Program files\Common Files\Microsoft Shared\Web Server Extensions\15\Logs. The log files are named with the name of the server, followed by the date of creation, and the time stamp. These logs are automatically generated at preset intervals, as well as each time admins run the IISRESET command. The older log files may be safely deleted, unless major changes have been made to the setup since their creation, but the latest log files should definitely be preserved. Physical damage caused by natural disasters is one of the dangers against which there can be no defense. However, admins can safeguard their SharePoint 2013 farm backups by creating copies of those and storing them in separate physical locations. Ideally, there should be 3 copies of every backup, stored in different physical locations, including one offsite or on the cloud. The copies should contain everything, from backup/recovery materials, database and transaction logs, and documents, to backups of usage statistics and trace logs. These are the 3 best practices that can help SharePoint administrators to greatly reduce the risk of data loss/corruption in SharePoint 2013 farm backups. Maintaining these can also reduce the hassles during restore operations, since the backups will be in pristine condition. Of course, verifying whether there is enough storage space available for the entire backup is also essential, but we believe that would be pretty obvious!